NEWTOWN, Conn. — To most people, dancing means pairing off in couples. But to Newtown resident Ellie Sturges, 77, dancing means hitting the floor in sets of four. Since 1971, Sturges has been a member of the Rocking Roosters Square Dance Club of Newtown, which just celebrated its 55th anniversary. "We do a modern western-type of square dancing, where four couples are doing something at once," Sturges said. "It’s four couples to a square." There are nearly 40 active members of the Rocking Roosters, who dance twice a month at Edmond Town Hall in Newtown. Members, who pay yearly dues, range from their teens to their 90s, and live in the surrounding towns. "We dance to all kinds of music such as country, pop and rock," she said. "As long as it’s got a good beat, that's all we care about." Members perform at fairs, nursing homes and churches — and they dance every year in the giant Newtown Labor Day Parade. “I love music, and I love that type of dancing," Sturges said, adding that her favorite kind of music for square dancing is country. 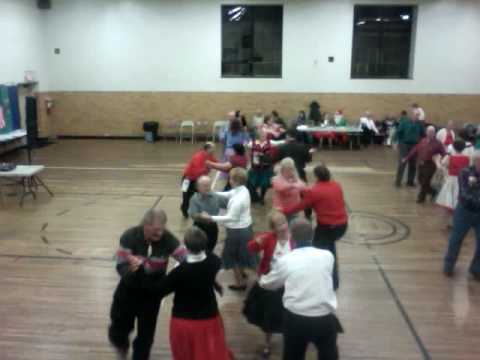 Members always wear square dance clothing: Women in white prairie skirts and red blouses with men in red or black pants and white shirts. All step out in soft-soled shoes. If you don't know how to square dance, club members teach classes with lessons offered from the fall to the spring. Just as with any form of dancing, square dancing is great exercise, Sturges said. "If you’ve danced two hours, you are sweating. You are moving the entire time. It helps keep the circulation going," she said. Sturges began taking lessons in 1963. She even met her late husband, Bob, through the club. "In march of 1970, I went square dancing at the Ox-Bows Square Dance Club in Oxford. I didn’t have a partner and Bob asked me to be his,” she said. Sturges believes that square dancing is making a comeback. “It was very popular in the 1970s to the 1990s. Then, it dropped off a little a bit but now there seems to be more interest in it," she said. Over the decades, some members have left to take care of family responsibilities, only to return years later. "I hope the club continues to grow," she said. For more information on the Rocking Roosters Square Dance Club of Newtown, click here or send an email to Ron Baldwin at jmclean558@gmail.com or Sue Ruscitto at sue.ruscitto@att.net. To take square dancing lessons, click here.